CfAS scientist Martina Esposito, working in the Leek group, developed a Josephson parametric amplifier (JPA) based on a lumped-element LC resonator which includes an array of superconducting quantum interference devices (SQUIDs). The main figures of merit of the device are a bandwidth BW = 15 MHz, a maximum gain G = 21 dB and a 1-dB compression point of -115 dBm. The characterization of the gain of the amplifier is shown in the figure. Researchers from Oxford’s Centre for Applied Superconductivity (CfAS) in Oxford Physics have uncovered the impressive properties of a novel superconductor, marking it out as the best of its kind with huge technological potential. The novel material in question, CaKFe4As4, was first synthesised only a couple of years ago both in Japan and Ames Laboratory, USA. Remarkably, its critical current density in single crystals was found to exceed that of all known iron-based superconductors, with a value of around 107 A/cm2. Members of the CfAS team were treated to a fabulous tour of the CERN facility by Glynn Kirby. As well as going into the LHC control room, we saw Nb3Sn Rutherford cable winding, all the stages of full-scale Nb3Sn magnet manufacture and the magnet development lab. The EUCAS conference social also took place on the CERN site at the cryogenic magnet testing station. Several members of the CfAS team attended the EUCAS 2017 conference in Geneva from 17th-21st September. 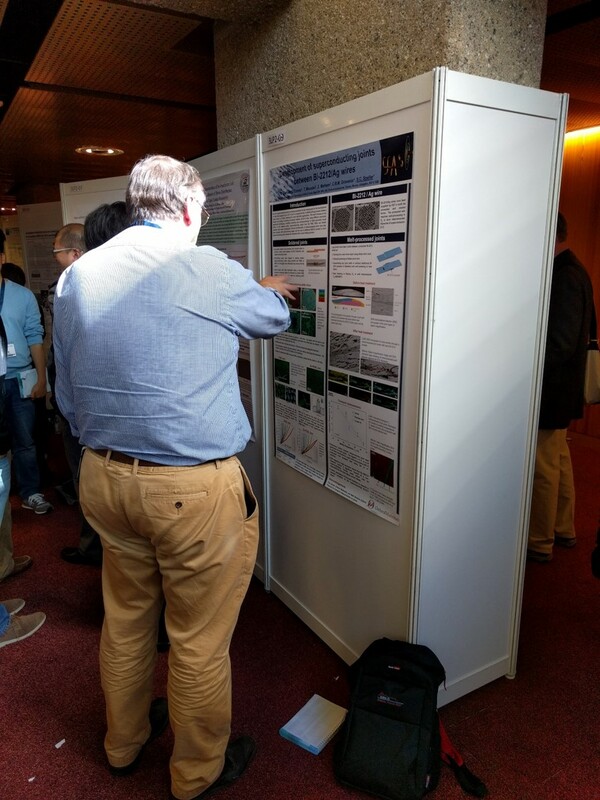 Some of the posters we presented on lead-free solders, joints in Bi-2212 and magnetic imaging of iron-based superconducting crystals can be found here.